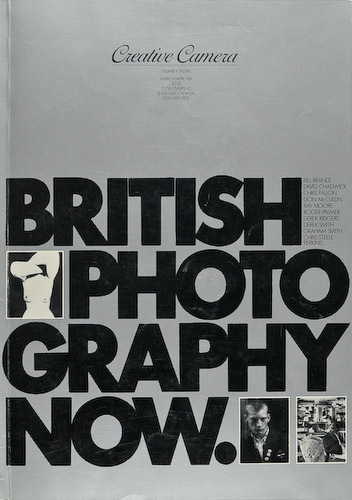 This article was first published in the March/April 1981 edition of Creative Camera magazine, a special double issue entitled ‘British Photography Now’. Moore was talking to art historian Ian Jeffrey, and the interview took place just prior to the opening of Moore’s major retrospective, held at London’s Hayward Gallery. This show was only the second exhibition by a living British photographer to be held there. The first had been Bill Brandt in 1970. Have you ever tried to, or wanted to, take pictures which summed up a society or a place? No. I’ve been involved with something more personal than that. Since childhood I’ve been especially conscious of place … more conscious of place than of people. I suppose that in recent photographs I have been making some kind of a return to Wallasey (‘the bedroom of Liverpool ‘) where I grew up in the 1930s. Whole tracts of the Cumbrian coast where I work nowadays remind me of those childhood areas. They also provide me with structures and images which allow me to comment on life in general. But really I’m a loner, a reflective pessimist, and I look for signs of finality and the end of time, impending departure and desperation … those graffiti which come up in one of my pictures and which are the marks of people anxious to express themselves and to get things off their chests. But I’m not looking for a social point, even though I’m drawn to these often melancholic areas. The following short insert is based on the recollections of John Prior, a student at Watford in the 1960s who studied under Ray. John’s current work can be seen at ‘Every So Often’ and on his main site at ‘John Prior Photography’. “I went to Watford Art College between 1966 and 1969. The College used an old Victorian school building in Alexander Road. Ray’s photography department was housed at the main Printing college in Hempstead Road a mile or so away. Watford was at that time, a major printing town having both Sun Printers and Odhams. Ray and his assistant Vic Bowley and a younger technician named Ralph ran the Photography Department at that time. The department had an excellent S-bend walk-in darkroom. I remember that the cameras the students had the use of were mainly Rolleiflex and Yashicamat TLRs, Praktica, Pentax Sv and Pentax S1a 35mm SLRs with standard 50mm lenses. I also remember a 135 mm and 200 mm Takumar. If I remember correctly Ray did not advocate their use, preferring us to use the 50/55mm lenses. Weston Master exposure meters were the order of the day. We usually shot on Kodak Tri-X rated at 320ASA and developed in ID11 diluted 1:1 for 9 or 10 minutes. There was a never-ending supply of 10” x 16” and larger Ilford bromide paper. Ray was very enthusiastic about the quality obtained from the Pentax lenses and I got the impression he used one himself at that time. One might think that Ray only shot in black and white, but on one occasion I remember him showing colour slides of beach rock textures and patterns, shot I believe on the Pembrokeshire coastline. The first project we did as students were photograms, I used a mask with fluids and improvised a turntable with a bromide box to produce a mandala, Ray was very impressed with this and asked for a copy. Ray was always encouraging and projects I remember were quite loose. We were encouraged to take a camera out and look. But you have, at times, worked in areas of outstanding natural beauty. Yes, I photographed in Pembrokeshire twenty-five years ago, working with an eye for conventional beauty. But l soon exhausted myself. The places didn’t seem to ring true to my complete self. I moved from the coastline to Milford Haven where there were more traces of man, and sometimes took pictures in the more run-down coastal area. I was drawn to the edge of civilization, and moved there more or less naturally, with no idea of understanding a place in depth. I found myself attending to the sad side of life, and find something of the same feeling in Thomas Hardy’s poems. I always see what is vanishing and melancholic. Images flit across the face of things and are gone. I wish I could get rid of the feeling sometimes. I can’t explain this quite. If I were dropped into a slum area I don’t think I’d want to photograph. I’d have to move out toward the edge. Definite statements have something of preaching about them. I prefer to tease out or to unravel what’s going on. Strive for it directly and you miss it. Beauty is a by-product, which arrives without your knowing it. When did you recognise this feeling for elusiveness in yourself, or in your art? I was drawing and seeing in this way before I started photographing in the early ’50s. I was always drawn to environments in which things shifted. When I put together still-life groups they often had connotations of disintegration and isolation. That’s what I was on about -that, and the play between elements. I’ve also been interested in the points at which cultures meet, and would like the chance to work more in the Middle East where the Twentieth Century invades the past. When cultures clash and when man clashes with nature even the shapes become weird. I work out of season, when people make marginal encroachments. The odd figure comes into my pictures, and dogs always seem to get in somehow. The children’s playground in this set, for example, loses all its magic in summer when the crowds are there. I prefer it haunted. I am also, in respect of this picture, intrigued by the way in which certain aspects of a site are changed by time or by a different light. I go back again and again to the same places, even though I make no attempt to repeat what I have previously done. Places have far more than I can exhaust. I think that people (photographers) move around too much. Standing around in the same spot would payoff more than we realise. I am also interested in visual humour, in shapes that relate in odd ways. The world has an Alice in Wonderland quality, which reflections present ready-made. Photography registers this quality, which in a painting would look codged up. Photography’s peculiar deadpan face suits the subject. Do you ever take stock of work to date? At times of crisis, such as when I’m putting together a retrospective, when one begins to see connections and to have some sense of having travelled along a path. But I never make a conscious decision to go in this direction rather than that. I must also at the moment of taking a photograph be mindless, free of conscious weighing up -too analytical and I’d be lost. Do any pictures get better on reflection? Not many. If I was asked I’d end up with about six. Most photographs are, to some degree or other, failures. The way in which they are failures helps one towards understanding, though. Maybe the medium can’t be stretched. You can’t have perfection or completion as with a painting, but this doesn’t stop some degree of communication; you can have a sufficiency; you can know what the photographer means. Sometimes, though, you can be landed in a strange situation, acutely aware of conglomerations of shapes and silver surfaces, and conscious that they don’t relate as well as they might. From what do you draw sustenance? From music and, to some degree, from poetry, more than from other photographs. But I don’t know how exactly I draw on these other arts. Music feeds me with something, though an experienced musician might find it incomprehensible. I find there a sense of structure perhaps, which complements what I do. Music bolsters up my confidence. Photography is a terribly fugitive medium. In painting one can absolve oneself through labour – so many painters do this, and some photographers too. Photography is something of a test of nerve. I see something and put it down in a few seconds, and that is all. Some pictures are quite intoxicating, with every blade of grass heavy with dew -yet there is nothing to it, for the camera does it automatically. Photography challenges one’s sense of oneself. This is why I prefer the image to be possessed of nothing ultra-remarkable in terms of technical finesse . Think of Horowitz’ pyrotechnics when he plays Beethoven, and of Schnabel who gives you Beethoven straight. I think Walker Evans in photography had this quality, for his pictures work, something comes through no matter how they are printed . With Cartier-Bresson too you can look beyond the surface of the picture which absents itself. Do you ever work with an audience in mind? No. I think I believe, with D. H. Lawrence, that art ‘s for my sake. If I like it I think that there’s a fair chance someone else will too. I never have got over the sense of excitement at a new image coming up on the paper and unravelling film from the developing tank -I’m a bit childlike in this respect. An expectant audience would be a dangerous thing; it might well infect me. What was it like to work with a number of other photographers around, as happened in the 1970s at Trent Polytechnic? As far as my own work was concerned it was something of an irritant. In Trent there was an over-intellectual approach; everything was measured, plumbed and weighed and this had a bad effect on younger students, who came almost to have a psycho-analyst’s knowledge of themselves. It all had some effect on me in that it opened my eyes to approaches to photography which I was already following myself. I was heartened, as I was when I went to the United States on a four¬month visit in 1970. Trent also had its effects on my approach to printing. Previously I had printed in the European (high-contrast) manner, which now I look back on as a disastrous phase. Trent was a help, but I was tough enough then not to let it have too much of an effect. Have you ever been influenced by another photographer? Never very consciously. I like the work of Harry Callahan and of Manuel Alvarez-Bravo, but they are more like endorsements of a way of working than influences. Some sides of Kertesz have impressed me, and in the ’50s I looked at the photographs of Paul Nash. In the ’50s, though, the only man I knew in photography was Norman Hall, editor of Photography magazine. The medium had very low status then -reserved for furtive men in dirty macs. On influences in general. I remember thirty years ago or so coming across and feasting on the writing of Arthur Machan, author of The Hill of Dreams. His writing may seem stilted and archaic now, but I was fascinated by his attention to penumbra and to the half-tones around a shadow -seemed to be describing meeting places between two ways of being. He helped focus that sort of thing in myself. Arnold Bax, the English composer, also fascinates me, although I came across him only recently. It was like finding a fellow-traveller way back of me. I discover other people’s work through my own, and generally find more to dwell on and to hold onto within music and writing. Why photography rather than painting? I might say that I take photographs because, in some respects at least, I couldn’t do what I wanted with painting. I went to art school and ended with a diploma from the Royal College of Art. Yet I always felt the absence in myself of an instinctive ability to make exciting marks. I couldn’t make the fluent statements of a good painter, couldn’t get that effortless one-ness with the medium where image and attitude come together -the sort of thing which immediately excites a spectator. I was also working in an ‘English’ tradition which, after 1920, favoured a dead, flat application of paint. But I had always been caught up in visual things and in questions of place and photography did suggest itself to me -as I also took photographs on the side. It was one stage away from the responsibilities involved in mark making, a more suitable way of producing images and could be a very strong ally if I could master it. Also, as with drawing, it was involved with change, with shifting light as well as with changes of approach and attitude. At that time I would start and go on with the same painting for weeks and never ended up with a painting. The severe disciplines of the camera were what I wanted, and I had to make a choice. Why are you interested in sequencing and grouping photographs? One thing can be played off against another, and this is one of the important things about photography. There is no ABC as to how it should be done. It must be instinctive -a sense begins to form -and it is a hard sweat. My current idea, and God knows if it’ll work, involves an image which repeats itself, exactly, like a motif or theme. The same things come up again and also draws attention to shifts of time, and should cause or coerce people into viewing the exhibition as a whole. To repeat an image is to develop a sense of structure -no drifting, no rambling -you need to be brought back. A major retrospective of Ray Moore’s photographs was staged by the Arts Council of Great Britain at the Hayward Gallery, London, from 24th April, 1981 until mid-June. To coincide with the exhibition Travelling Light published the book ‘Murmurs at Every Turn’ with a sequence of 48 pictures by Ray Moore – and with accompanying essays by Jonathon Williams, Mark Haworth-Booth and Ian Jeffrey, who asked the questions in this interview.